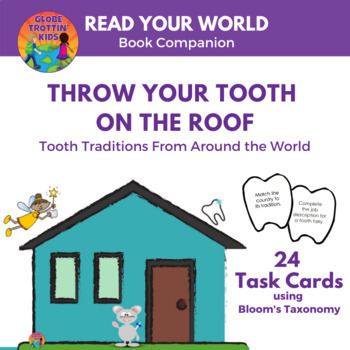 These task cards offer a variety of ways for children to respond to Throw Your Tooth on the Roof: Tooth Traditions Around the World by Selby B. Beeler. Using Bloom's Taxonomy to focus on higher level thinking skills, students will be recalling facts, explaining ideas, using information in new situations, drawing connections, justifying a position, and producing original work. 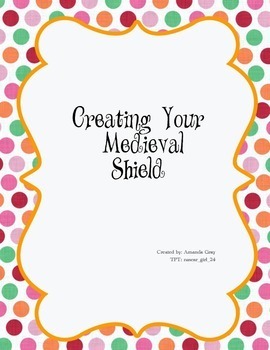 This package is set up and ready for you to use with your students use in creating their own medieval shields. This includes information about the significance of background designs, colors, line decorations, symbols, and animals. There is also a student sheet for your students to be able to apply the knowledge in the package to tell you what they now know about a particular shield. Three blank templates for students to begin their design. Students will use pictorial representations to multiply or divide fractions by fractions or fractions by whole numbers. 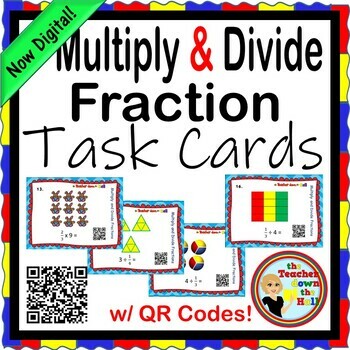 They may use the QR Code on each card to check their own answers. Or, pass cards around your classroom from one student to another and students will solve equations and record on the included answer sheet. Both ways are great reviews of Multiplying and Dividing Fractions. 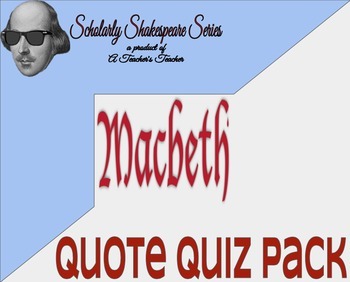 This Macbeth Quote Quiz Pack, part of the Scholarly Shakespeare Series, provides all of the following resources regarding an assessment for important lines from the tragedy throughout Acts 1 and 2: A quote quiz preparation packet, a slideshow of preparation answers, three versions of the quote quiz from Acts 1 & 2 with answer keys, and access to a review game with easy-to-use quote handouts for student use during the game. Part of the Scholarly Shakespeare Series from A Teacher's Teacher, this is a great resource to help your students dig deeper into Shakespeare's tragedy Macbeth. Make Addition FUN this Halloween! 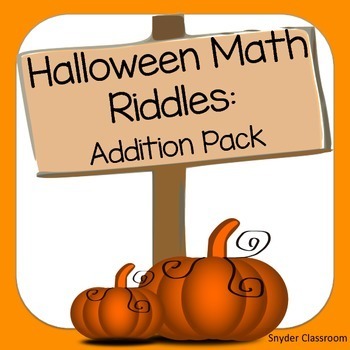 Need a fun activity to help your students practice addition before Halloween? This activity is full of computation practice. The students also have a goal of solving a riddle at the end. It is a great way to combine fun and learning! The item includes the original full color version and the grayscale version (for easy duplication in a copier for your students). Within the package you'll receive 1 riddle with 2 digit plus 2 digit problems, 1 riddle with 3 digit plus 2 digit problems , and 1 riddle with 3 digit plus 3 digit problems.